Trinnov at Studio Omega – La Musique est à tout le Monde ! Bienvenue sur le blog de Woodbrass. A few chosen journalists were invited last month at an event that turned out to be a real treat: one of the most cutting-edge French companies in one of the best studios around. Trinnov Audio was demoing its flagship product the MC Processor in the main booth of Studio Omega in Suresnes (west of Paris), with very impressive results. Sting, Lenny Kravitz, Céline Dion, Daniel Darc, Alicia Keys, Phil Collins or even comedy artists such as Fatal Bazooka and Tokio Hotel: the list of million-selling albums created between the four walls of Omega is guaranteed to stun. Once we stepped inside it was easy to understand why: the main tracking room is bathed in natural light (an extremely rare feat in the studio business), and the control room is packed with gear that would make the most jaded sound engineer green with envy. 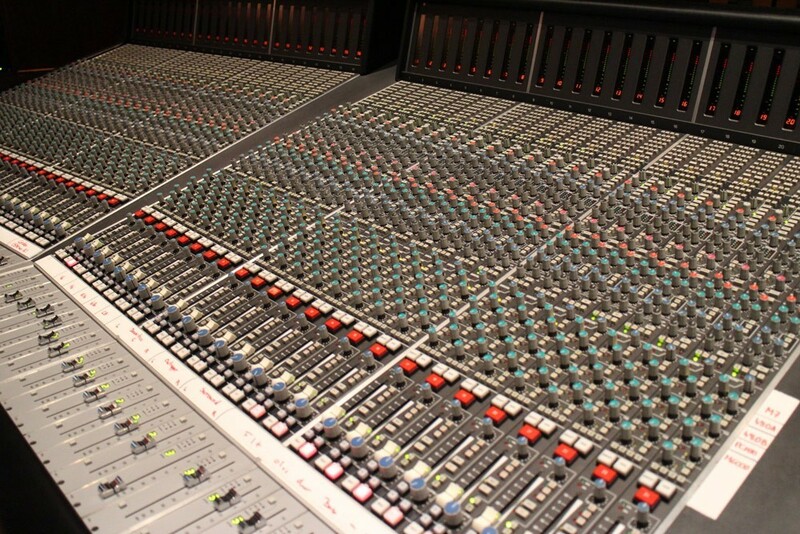 The console is a 96-channel SSL 9000XL, while the adjacent racks are overflowing with classic rack units such as 1073 Neve preamps of Urei / Universal Audio 1176 comps. We find ourselves sitting where the mixing engineer would normally be, facing an army of SSL faders, ready to listen to what the MC Processor can do. Trinnov Audio is a French company founded in 2000. 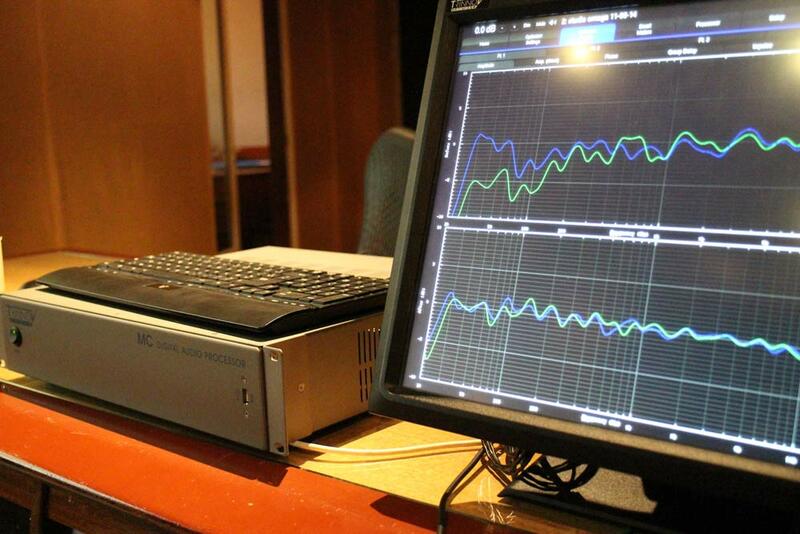 Right from the start, it specialized in sonic spatial localization. Here’s how it works: since stereo was invented – meaning two speakers playing two signals that differ from each other, as opposed to mono, like on the early Beatles album on which all the music comes out of a single speaker – sound engineer have been panning sounds in a spatial way. The stereo field is an imaginary 180-degree landscape where objects can be placed left, right, center and everything in between. If you pan a guitar all the way to the left, no guitar sound will come out of the right speaker. By moving the guitar from left to center to right, more and more guitar will be coming out of the right speaker while it progressively disappears from the left speaker. When an object is placed at the center, its sound comes from both speakers at the same volume. We’ve all experienced sonic spatial localization in its simplest form by lending one of your earbuds to a friend while listening to your Walkman: some instruments disappear, while others are louder than usual. The 5.1. sound used in a lot of movies functions in the same fashion, except for the fact that the landscape is now 360 degrees. When you hear the murderer’s step move from the rear right to the rear left, you are once again listening to the sound growing louder in one speaker and fainter in another. This is all well and good, but in the real world a real stereo is a very rare thing. It requires two perfectly identical speakers, placed at the same exact height, and the listeners needs to be sitting at the same distance from each speaker. The room in which the listening occurs can also transform the stereo image by reflecting or absorbing certain frequencies in an unexpected fashion. For a sound engineer, mixing a track can quickly turn into a nightmare if the room is not properly tuned for that purpose. This is when Trinnov Audio products come into play, namely the MC Processor (for surround sound) and the ST-2 (stereo only). 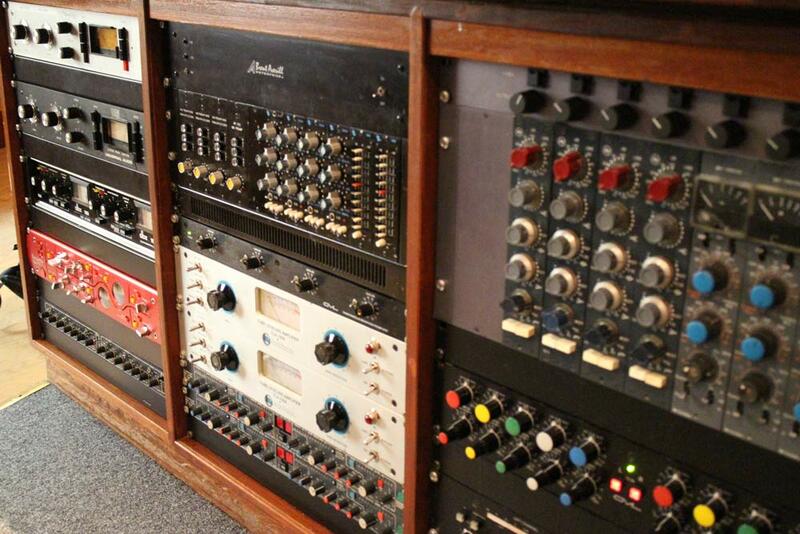 Those rack units are controlled by a piece of software that analyzes the listener and the speaker’s location, and the way the room affects the sound. The system then corrects the problems and creates a perfect sonic picture. 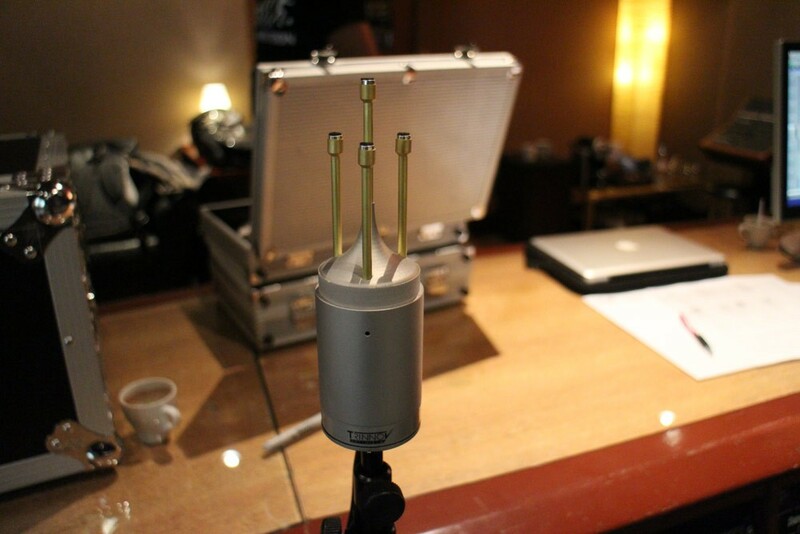 The way the process works can be very finely tuned of course, but the core of it is done automatically thanks to the Trinnov 3D Mic, a very weird-looking microphone that takes measurements and feeds them to the correction and optimization units. We could have imagined the control room at Studio Omega to be a perfectly tuned room where nothing was left to chance, but the Trinnov system told us a very different story. We listened to its effect on a Coldplay song, with the help of a button that allowed us to switch from the original signal to the processed one. Once the Trinnov comes into play, we cearly hear frequencies that were lost beforehand, and the stereo field slightly moves towards the left to become properly centered. Without it, the stereo field is slightly unbalanced towards the right speaker, and the low-end is muddier. The difference is truly stunning. The Studio Omega control room has been designed for audio and it still benefits from the Trinnov treatment, so we can only imagine how huge a difference the system would make in a less specialized space. A Trinnov system does not come come cheap: the stereo version comes close to a total sum of 5000 euros for the ST2 unit and the 3D Mic. What could possibly justify such an investment? For a hi-fi enthusiast who has already spent thousands of euros getting the best speakers money can buy, going the Trinnov way almost seems logical. But for a sound engineer who makes a living by recording and mixing records, the ST2 could even be considered as a profitable buy. Obviously, those 5000 euros could also be spent in a sexier mic or tube preamp, but the Trinnov offers working conditions that can’t be had in any other way. 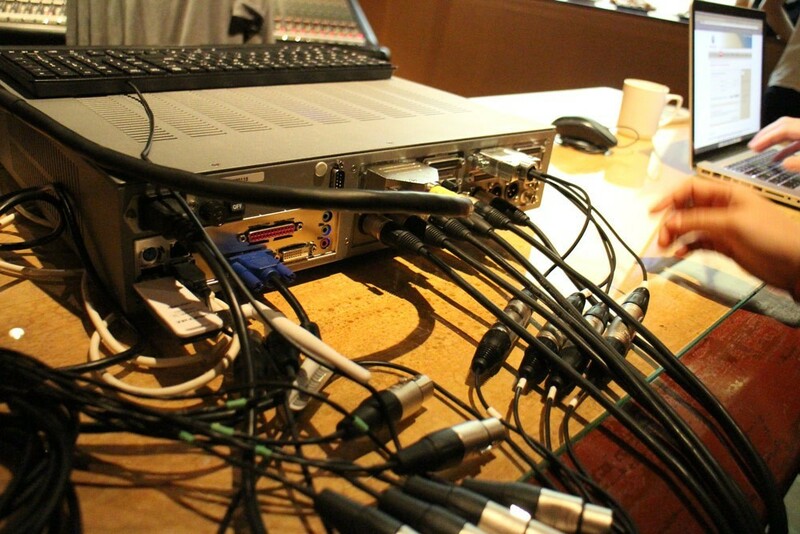 During the session, we bumped into engineer-for-the-stars François Gauthier (Christophe Maé, Christophe Willem, Roberto Alagna, Mickael Youn, Joss Stone and many others) who told us about his experience as a Trinnov customer: « Since I set up the Trinnov system in my studio, my mixing gets done twice as fast ». A little while ago, François found himself having to mix a Johnny Hallyday concert for TV in 3 days only, and the whole team eventually congratulated him for the sound he got, a miracle he couldn’t have performed without the Trinnov. If mixing is how you make a living, being able to work faster and in a better environment without having the question the fidelity of your speakers is a tempting proposition. And for those of us who work in a home studio featuring less than 5000 euros worth of gear, we can still marvel at the fact that systems like the Trinnov do exist and keep pushing the science of sound a little further.